When I was first asked to write an article for ringEr-Notes, I thought, “Why me? I’m not that interesting!” Then I thought about it. I believe that I have a unique perspective of our community of musicians and our art. Handbells are my life, literally. I ring in a community handbell ensemble, I ring with a church handbell choir, I perform as a soloist, and I am part of the national staff at Handbell Musicians of America. A majority of who I am, my experiences, and my time are involved with handbells. I started ringing handbells in a newly formed children’s handbell choir at my church when I started the 6th grade. At age sixteen, I was 5 feet tall and ringing the low bass bells (C3 to B3) in the adult choir! 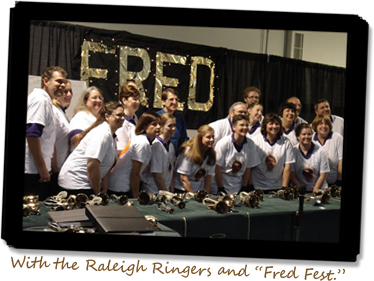 This experience was life-changing as my passion and interest in handbells flourished. Little did I know at the time, but my experiences, diversity in positions, and various ensemble exposures have shaped who I am as a person, as well as a musician. I began handbell ringing 25 years ago. Since then, I have rung everywhere from the high treble to the low bass (C3 to B3). Today, I ring not only in a church choir, but also am a founding member of a Cincinnati-based community handbell ensemble. The community handbell ensemble had an interesting beginning. We originally auditioned to perform with the Cincinnati Pops Orchestra for their Christmas 2008 holiday concerts. The original ensemble was a one-time deal. We were to have an amazing opportunity to ring with the Cincinnati Pops and that’s it. However, the members of the group had so much fun ringing and enjoying each other’s company; we decided to continue on with the challenge of ringing high level music as a permanent community choir known as Queen City Bronze. Along with my ensemble ringing experiences, I am what I like to call an “accidental” solo ringer. Fourteen years ago, my cousin, who was also a handbell musician, wanted Christine Anderson’s handbell solo “The Lord’s Prayer” rung at her wedding. She knew that I already rang in a sextet at the time, and she asked me to perform this piece during the wedding ceremony. Since then, I have been ringing solos at various congregations whenever I get the chance! I even purchased my own set of handbells five years ago. As a ringer, I have grown to understand handbells at a different level of musicianship and musicality. Handbells exemplify the ultimate team sport. Trust, dependence, coordination, repetition, and communication are all words that embody the team work needed for handbells. The challenges and teamwork needed for success in handbells are aspects I enjoy at a high level. Two years ago I began working part-time at the Handbell Musicians of America national office. Prior to working at the national office, to me, my membership meant I was able to attend events and get a copy of Overtones in the mail. I really had no idea the amount of resources that are available to our membership until I started working at the Guild office. I attended events most of the time by myself and found that handbell musicians are a very welcoming and friendly group of people. No matter what event I attended there was always someone who asked me to join their group for lunch or dinner. I think this makes us a very unique group of people. In the national office this unique sense of community became even more apparent to me as I started speaking with members from all over the country. I like being able to answer member’s questions regarding how to do a technique over the phone. I do not have to reference a book, I know how to do it. There is nothing like trying to teach someone over the phone how to teach someone else the “singing bell technique” at their rehearsal that night. Handbell ringing promotes community, unity, and teamwork. As a handbell musician, I am blessed to have had so many life-affecting experiences. I would encourage all ringers to take a step back in this busy season and reflect on their own special reasons for ringing, and recall their own special memories from ringing. This art and craft of music and handbell ringing is exceptional, and we should take heed to continue sharing the gift of handbells and supporting handbell ringing at every opportunity. 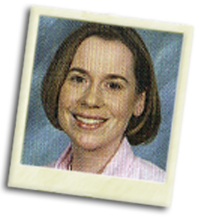 Sandy holds a Bachelor of Arts degree in music from Miami University, Oxford, Ohio, where her primary instrument was piano. She began ringing handbells 25 years ago with various groups including Westminster Handbell Musicians of America Ensemble (a select sextet). She is a member of the community handbell ensemble Queen City Bronze, based in Cincinnati, Ohio. She currently plays handbell solos at various congregations throughout the year. She has a solid history of solo and small ensemble bell ringing, having had the opportunity to play on tour in England and other venues throughout the United States. Become part of our exciting, new Virtual Handbell Ensemble project, in which you will have the opportunity to perform a new work of music via video uploads. 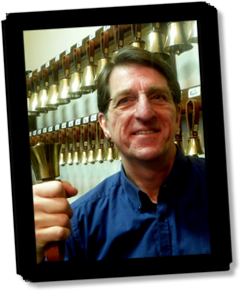 Take a look at this video with composer James Meredith, then head on over to our Virtual Handbell Ensemble Project website at virtual.HandbellMusicians.org to learn more. It’s interesting to note that I managed to be heavily involved in church music from a young age, a weekly church organist from age 14, go on to earn two university degrees in organ performance, yet never know what a handbell was until starting my position as director of music for the American Church in Paris! Of course we’re talking several decades ago but it still strikes me as odd. However, when handbells entered my world it was love at first hearing. A touring choir from California under the direction of Richard Coulter performed a concert at the American Church and also rang for a service. I was hooked and the seed was planted. It took a few years before we were able to purchase our first two octaves, which have since grown to include sets of bells by the three major companies, plus 7 octaves of chimes. The most beneficial tool in learning to become a ringer/director were the Directors Seminars (now National Seminar) sponsored by the Guild. I have the honor of being on the faculty this coming July for the National Seminar in Portland and am excited to share some of what I’ve learned, but also to benefit myself from the wealth of experience that will be represented. I hope to see some of you there! Having a sense of humor seems a prerequisite for being a handbell ringer. When I received a contract from the Raleigh Ringers to conduct for the Capital Area Festival in Raleigh, NC, I sent back a note agreeing to the conditions but with the addition of two nice North Carolina chickens, in jest of course! At the event I was ceremoniously presented with a long box appropriate for long-stemmed roses. However, instead of roses, it contained two long rubber chickens with the back claws painted black. They were Tar Heel chickens. Fred is a native of Washington state where he began organ studies with Dr. Edward Hansen of Seattle. He earned organ performance degrees from Syracuse University and the University of Michigan, moving to Paris in 1972 for organ study with Marie-Claire Alain and Maurice Duruflé. Since 1976, he has been Director of Music at the American Church in Paris where he is organist and conducts the Adult Choir, the ACP Bronze Ringers, and the Celebration Ringers. Fred also organizes the weekly Sunday evening classical concert series. He has numerous choral and handbell works published in the United States and is the Honorary Associate Director of the Raleigh Ringers of North Carolina as well as co-conductor for the yearly European Handbell Festival. a significant portion of each ringEr-Notes edition since our first edition in April of 2009.
the General Resources on the Member Resource Page. in the national office to pursue other opportunities. We thank Katie for her service and wish her the best in her future endeavors. focused on highlighting our online resources and our Area events. Stay Tuned!